Form Description: Designed for those repairing automobiles of all types. You can include charges for various labor and parts, and subtotals and taxes are computed automatically. Includes space for detailed information on the vehicle and contact information for the customer. 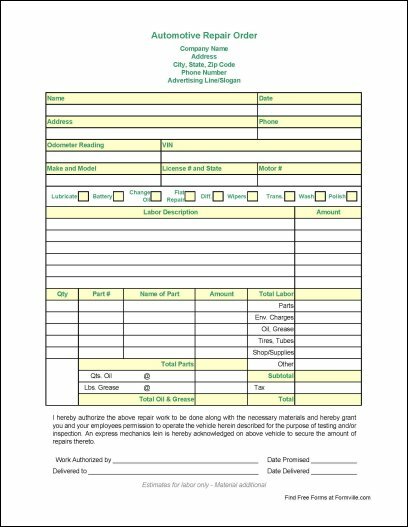 You can download a PDF version of the "Automotive Repair Order" form absolutely free. You can also, for a small payment, download a fully editable version of the form that you can customize as you desire. (Don't know which format to choose? Here's how to make your choice.) What would you like to do? Formville's free "Automotive Repair Order" form is associated with the following keywords: automotive, cars, repair.